The Vision for specialist capabilities aims to enhance policing's response to new and complex threats to better protect the public by developing our network and the way police deliver specialist capabilities by reinforcing and connecting policing locally, nationally and beyond. Creating a network of undercover officers to target offenders grooming children online for sexual exploitation. Developing national capabilities to combat human trafficking and modern slavery, working with partners to identify best practice, trends and patterns for prevention of human trafficking and modern slavery. Increasing the numbers of firearms officers and strengthening regional organised crime unite to support the fight against organised crime. U>Specialist Capabilities Programme The Specialist Capabilities Programme is delivering the vision for the Specialist Capabilities reform strand. The Programme aims to make specialist capabilities, like armed policing, surveillance and major investigation, stronger and more affordable. During October 2016, the Programme presented its initial findings and recommendations to the Association of Police and Crime Commissioners (APCC) General Meeting and the Chief Constables Council. The same material was shared and presented at both meetings. The full report is available here. To support the continuation of the programme including reviewing for cybercrime, intelligence and proactive investigation capabilities. PCCs added a fourth recommendation committing the Programme to further activity, to consider the Governance implications of the work. This work was commissioned by a governance working group of the Specialist Capabilities Board and was undertaken by the Police Foundation. In December 2016, the Police Foundation published this research. The Specialist Capabilities Programme is funded from three sources; monies carried forward from the Association of Chief Police Officers (ACPO), the National Police Coordination Centre (NPoCC) contribution and funding from the Home Office's Police Transformation Fund. The Specialist Capabilities Programme reports into the Specialist Capabilities Board, which in turn, reports to the Police Reform and Transformation Board. The Specialist Capabilities Board is chaired by NPCC Chair, Sara Thornton. membership includes representatives from the APCC, chief Constables, the Home Office and the National Crime Agency. The Programme will begin to collect and analyse data for cybercrime, intelligence and proactive investigation capabilities. Alongside this activity, the programme will develop a structured approach for the implementation of the agreed proposals. 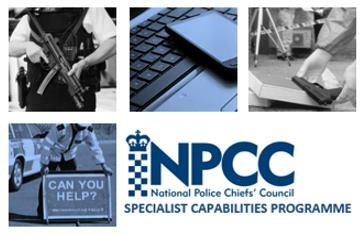 The Specialist Capabilities Programme, reporting into the Specialist Capabilities Board, is chaired by NPCC Chair Sara Thornton with membership including representatives from the Association of Police and Crime Commissioners (APCC), Chief Constables, the Home Office and the National Crime Agency. The Specialist Capabilities Programme is funded from three sources; monies carried forward from the Association of Chief Police Officers (ACPO), the National Police Coordination Centre (NPoCC) contribution and Home Office Transformation Funds.